Ok, you must be wondering why the photo of pasta on a low carb blog. I mentioned in an earlier post about a weak moment in Italy, succumbing to the lure of pasta. 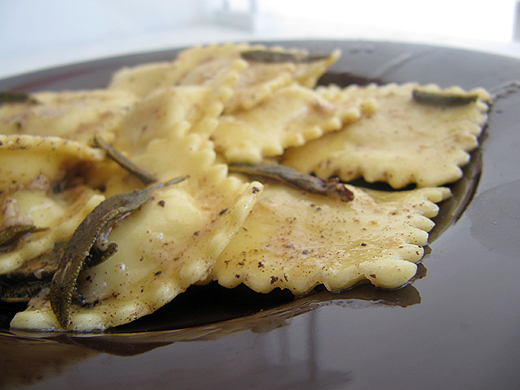 There is nothing like the fresh pasta in Italy, it is light, airy and beyond description. The brown butter and sage sauce was a highlight. I am so glad I tried the pasta because the sauce is something that would be great on vegetables, veal or any number of things. It has a nutty flavor that is so delicious. The aroma and the taste of the sage is perfect. Sprinkle with parmesan cheese shavings and it is the start of something wonderful! Melt butter in large skillet over medium low heat. Add sage leaves and let butter brown. Watch carefully as it starts to foam. Brown specks appear and you will smell a nutty aroma. Remove from heat. Add seasonings and lemon juice. This can be used immediately or will keep in the refrigerator. Tips: use a light colored skillet to be able to see butter as it changes color. Slice butter in tablespoon slices to melt evenly.